Let the stress melt away as you revel in the peace and beauty of this resort room at the Mahogany Hall property in San Ignacio. This romantic spot is perfect for two guests to indulge in the infinity pool, river views, and tropical ambiance without a worry. Set right on the Mopan River, the Mahogany Hall Resort offers the ideal location inside of San Ignacio to unwind in tranquility. Three miles from the heart of San Ignacio, you'll be close enough to explore the town, while being surrounded by nature. You'll be within a short distance of some of the jungles, Mayan ruins, and other attractions that this part of Belize is famous for. The tropical accents of the room blend with the river view to create a tranquil spot to unwind in style. Use the free WiFi to stream some gentle music while you enjoy the central air conditioning. Flip through the cable channels before a soak in the Spanish-tiled bath. Hit the infinity pool and then enjoy a luxurious night of sleep on the hand-carved mahogany queen-size bed. With room for two guests, this is the perfect place for a romantic getaway for you and your special someone. 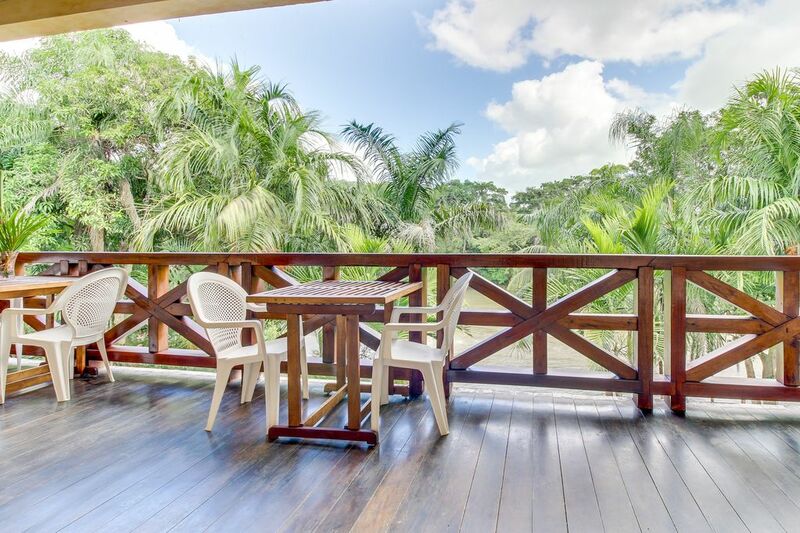 Whether you're diving into the adventures with a custom tour booked by the concierge, relaxing by the pool, or simply taking in the views of the river, this Belize getaway surrounds you with relaxation. The resort is so very clean and beautiful! It is a bit away from town, but there is a regular cab that runs and the cost is worth the solitude! We loved listening to the river and the food is great! We especially loved the staff - everyone is so very friendly and wonderful! It is everything they said it would be!! The resort is so very clean and beautiful! It is a bit away from town, but there is a regular cab that runs and the cost is worth the solitude! We loved listening to the river and the food is great! We especially loved the staff - everyone is so very friendly and wonderful! Where do I start with how great Mahogany Hall is...? We booked this place thinking it looked nicer and likely more relaxing than the other locations in San Ignacio. We were greeted when we pulled up and the staff took our bags and directed us where to park. We had a seat at the quant little bar and were given a cool washcloth and the bartender started making us a delicious frozen local welcome cocktail. He then told us a bit about the property as we enjoyed our drink and asked if we’d like to have dinner tonight. As it turns out we were the only guests, not just tonight but our complete four day stay. They had two dinner options and prepared a fantastic three course meal which we ate by the waterfall pool with tiki torches while listening to the river. We also had many great breakfasts and would highly recommend the coconut waffles and Rico’s omelette. They had our table set just for us including decorative petals! Our room was clean and the view and sounds of the river and natural jungle noises were so relaxing. We read books in the hammocks and felt relaxed and catered to around every corner. Everyone was helpful and we were appreciative of their tourism advice. We met the owner Richard and had some nice conversation and advice on activity’s. He also organized a relaxing river tube down the Mopan river (which is right in the front of the property) with a young local named Christian who had tubes and river knowledge. We were picked up at another area resort by Richard and paid a small charge to Christian for his time. The rooms are beautiful and the AC is must. Property is amazing, service is friendly and fantastic, 10 minutes to San Ignacio, this place is perfect for your stay outside San Ignacio and I’d recommend it to anyone. Place is amazing. Staff is amazing as well. Do go and enjoy. Eat dinner in town it's cheap and way better.